While few have run a “want partner advert" however many can sympathize with the painful dilemma it describes. 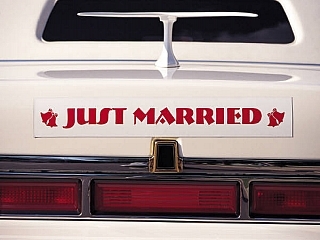 How they wish it were a "just married sign" at the back of their car instead. But, in more subtle ways, many who have “advertised,” and have found out that seeking a mate in today’s world is often a frustrating problem and complex process. There was no one I could really talk to. I stopped eating and would begin to cry for no reason. And I couldn't confide in anyone because my feelings were so intense that I was ashamed. . . . I think people have given up on me as far as getting married." Although concerned, the thousands of men and women like Elaine usually have not studied the why of their circumstances. They frequently are unaware of sociologists’ studies pointing to the increasing problem of finding a good marriage mate. They do not know that this research blames such factors as the massive population shift from rural to city life and the accompanying “moral revolution” that has questioned just about every aspect of the male-female relationship. However, most are aware of the fast rise of total marital failure, politely called “divorce.” They know that many people today cruelly and abruptly drop one lover for another. They are conscious of the flood of conflicting advice that they receive and of the drastically different approaches that their single friends take in seeking a companion. They sense the confusion. Is there a way out of all of this? Choice of a marriage mate is of an intensely personal nature, but are there guidelines or principles that both the youth and the older one can follow? Are there definite pitfalls to be avoided? Naturally the circumstances and needs of a widow with small children, an older divorced man and a young adult differ greatly. Yet single persons of all ages are faced with certain popular “myths” about matrimony that greatly add to their dilemma. Investigating the value of some of these should help to clear away part of the confusion. One common myth is that since ‘opposites attract,’ then choosing someone who is very different from you will add interest to a marriage match. There is, of course, much curiosity about someone from a contrasting environment, religion or nationality. But think about these, does not common sense tell you that your friends are those with whom you share similar interests? How will you fare with someone who constantly pulls in another direction or who may disdain those things that you enjoy? Actually, the more a couple agree on what they commonly hold to be the most important aspects of life, the smoother their daily life will be. That which is different may be initially exciting, but in the long run the relationship will become a source of strain. Infatuation has been defined as “foolish admiration,” an idealizing of a person whom you really do not know. The ‘one and only’ myth, and the ‘love at first sight’ myth, are both symptoms of infatuation. When one seeks a mate in terms of a Mr. Right or a Miss Perfect, there is the expectation that suddenly the tailor-made marriage partner will appear. Of course, a person is naturally more attracted to some people initially than to others—their appearance, manner, one’s own mood at the time all affect this. Sadly, this is not always true. Infatuation can continue right into wedlock. How so? When a relationship is so emotionally “charged” right from the start, it frequently leads to a very physical relationship. Such infatuated ones often smooth over differences with passion by petting. The disastrous result is that two virtual strangers entering life’s most intimate bond. The truth of this would seem to be supported by widows and widowers who have eventually remarried and found happiness. Unfortunately, this marriage myths put much pressure on single people. Such sayings thus proclaim that singleness is inherently bad. The individual is made to feel “abnormal” or, perhaps, even latently homosexual. It is one thing if a person needs to marry out of his own will, but does have to do it just because he fears not being in matrimony? In fact there is nothing wrong in a person simply recognizing that he does not need to marry. A myth is a fantasy, a popular lie. And we can certainly see that following any of the myths that we have discussed would add to the confusion of one contemplating or facing the marriage-singleness question. So avoiding being guided by them as you make your decisions.